hi toasty my lightboost was working fine but after i installed the latest nvidia update it seems to work but i don't see the 3d light light up on my benq xl2420te and actually it doesn't really work until i manually apply strobe light brightness to one of the settings any fix for the latest update on the way? I'm sure this has been asked before, but I can't sift through 35 pages of replies. Why doesn't it offer non-strobed 120 Hz? Should I use 121 Hz or 111 Hz? (12-15-2013 03:52 PM)kevindd992002 Wrote: [ -> ] So regardless of what refresh rates are installed and whether 2D LB is turned on or off, NVIDIA will set the screen to have a 120Hz refresh rate when 3D is enabled? Why do we need the swapped version then? 3D Vision requires 120 Hz to be non-strobed to enable properly. (12-15-2013 03:52 PM)kevindd992002 Wrote: [ -> ] It happens after installing the refresh rates whether using the regular version or swapped version of your program. And yes it only happens after on reboot. After that everything is fine. You're not being clear about what happens. You said you have the problem where it only works for one reboot, but now you say it's fine after reboot. What exactly is happening? Sorry, let me explain it again. 1.) Coming from a without any strobelight application at all, I run strobelight-setup.exe and install the refresh rates properly. 2.) I copy strobelight.exe to the startup folder. 3.) I restart the computer and I receive that error message. 4.) I exit the strobelight.exe app from the system tray and run it again by double-clicking the .exe in the startup folder and it seemed to work this time. *** My only concern is why does it have to give me that error message? This never happened when I installed Beta 2 the first time around. Same here. After updating from beta 2 to beta 3, I got this error message every windows startup. I've tried uninstall strobelight and than install beta 3 and still got this error every startup! BenQ XL2411T monitor. Win7*64. NVidia 314.22 drivers. Isn't this enough to conclude that there is really a bug when installing Beta 3 or something? (12-17-2013 06:20 AM)Snow Wrote: [ -> ] Same here. After updating from beta 2 to beta 3, I got this error message every windows startup. I've tried uninstall strobelight and than install beta 3 and still got this error every startup! BenQ XL2411T monitor. Win7*64. NVidia 314.22 drivers. I tracked this down to a Windows issue where if everything loads too quickly, the refresh rates aren't available when the program starts because the desktop isn't available yet. I added a check to make sure the desktop is available before checking the refresh rates. (12-15-2013 11:25 PM)kevindd992002 Wrote: [ -> ] *** My only concern is why does it have to give me that error message? This never happened when I installed Beta 2 the first time around. I added a check in Beta 3 because people were trying to run the program in cases where the refresh rates weren't available. It's a good thing I added that check because it revealed a problem that I didn't know about. If you're getting this message with Beta 3, then in Beta 2, "Strobing on" and "Strobing off" should have been grayed out in the menu under the same circumstances. 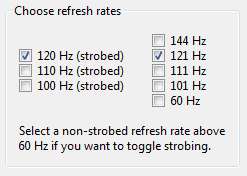 Strobed and non-strobed refresh rates require different timing parameters, and there's no way to have two 120 Hz refresh rates at the same time in Windows, so I made the non-strobed refresh rates 121/111/101 Hz as a way of switching modes. 121 Hz is actually 120.5 Hz and works properly with all the compatible monitors. Thanks, I will try this on my end and see. That makes sense because I use an SSD on my system which could've caused the issue because of its fast loading time. What issues does Geforce Experience cause with the app? I really want to try it out but at the same time I really enjoy having shadow play. (12-18-2013 01:08 AM)RavikAztar Wrote: [ -> ] What issues does Geforce Experience cause with the app? I really want to try it out but at the same time I really enjoy having shadow play. NVIDIA's driver has a bug where the refresh rates aren't fully available if something triggers a hardware scan, and GeForce Experience triggers that on startup. The refresh rates end up being listed in the NVIDIA control panel but not in the Windows screen resolution settings, so games might not be able to use them. (12-16-2013 07:15 AM)saadaziz Wrote: [ -> ] hi toasty my lightboost was working fine but after i installed the latest nvidia update it seems to work but i don't see the 3d light light up on my benq xl2420te and actually it doesn't really work until i manually apply strobe light brightness to one of the settings any fix for the latest update on the way? There isn't anything different about the latest driver. Did you make sure GeForce Experience was not installed? If that's not the problem, try reinstalling the refresh rates.